The LIXIL Group has built a Group-wide occupational health and safety management system to protect all employees, and is working to expand its scope. The LIXIL Group, in our Group Charter of Corporate Behavior, commits to “promoting the mental and physical well-being of all workers by prioritizing safety in order to realize an ideal accident-free working environment.” To this aim, we have introduced an occupational health and safety management system and implemented a PDCA approach to help prevent accidents at work. LIXIL Group believes that all occupational injuries and diseases can be prevented through internal initiatives, and we aim to achieve zero work-related injuries and diseases. To achieve this goal, we share a common core value that “each person is irreplaceable,” and we foster a company culture where we always act with a “safety first,” mindset. The Group EHS Committee, chaired by the Group’s deputy president and executive officer responsible for optimizing production, sets common employee health and safety policies and core EHS rules. Upon which Group-wide EHS management systems are built and their applicable scope is extended. We also have a Health and Safety Committee in each business segment, which discusses health and safety issues to help generate continuous improvements. 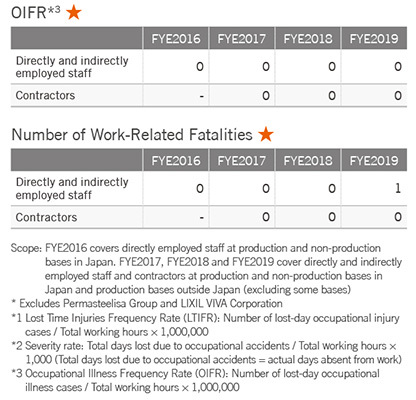 Scope: FYE2016 covers directly employed staff at production and non-production bases in Japan. FYE2017 and FYE2018 cover directly and indirectly employed staff and contractor at production and non-production bases in Japan and a majority of overseas production bases. The LIXIL Group seeks to actively prevent work-related accidents by ensuring all employees follow established safety rules and anticipate dangers at work. That means pinpointing and eradicating any dangerous elements relating to machinery, facilities, or unsafe action by workers, and sharing best-practice examples to avoid work-related accidents. To prevent reoccurrence, we compare and analyze any similarities between accidents that do occur, and instigates improvements. LIXIL Corporation also provides practical training sessions (“Anzen Dojo”) in which staff from Japan and overseas can experience simulations of past accidents. Ensuring all employees are physically and emotionally healthy is important for creating a vibrant and vigorous workplace. The LIXIL Group seeks to support strong employee health and well-being by providing various opportunities relating to disease prevention, health education and health promotion. Working with the LIXIL Health Insurance Society, LIXIL Corporation organizes its health support activities under the LIXIL WELLNESS umbrella. All employees undergo annual medical check-ups, and industrial doctors determine whether individual employee require attention at work. In addition, employees with high health risks are encouraged to visit a doctor to enable them to continue working in a healthy and safe manner without exacerbating their symptoms. 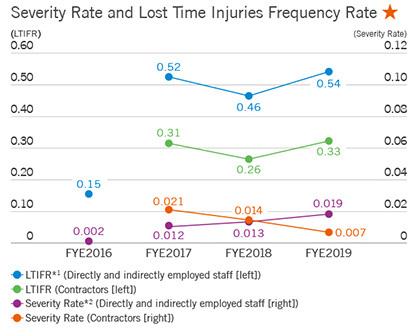 Extra attention is paid to encouraging priority cases (50 employees in FYE2017 and 37 in FYE2018) to visit a healthcare facility, and, as a result, we achieved a 100% consultation rate. The LIXIL Health Insurance Society covers basic medical examination fees for both employees and their dependents. We are also focused on caring for mental health, which is important in ensuring overall wellness of employees. We have specialist industry physicians at our business sites, and offer mental health management training for managers to help create a working environment conducive to early detection and early treatment. We also conduct seminars to ensure all the employees have the correct knowledge to help themselves, and offer a Workplace Reinstatement Program to help employees who have been on sick leave to facilitate their return to the workforce. To comply with new legal requirements on stress tests introduced in FYE2017, we have been conducting stress tests each year between May and June from 2016. In FYE2017, 84.5% of employees took the stress test, rising to 93.9% in FYE2018. Workplaces with ten or more respondents (departments, Group companies, sales offices) that were judged to be high stress locations are asked to create an action plan sheet, and alleviate any factors that are causing stress. We also recommend workplaces to offer a private appointment with an occupational physician to individual employees judged to be under considerable stress. As a result of these activities, the LIXIL Group has been recognized two years running in 2017 and 2018 as a certified health and productivity management organization in the large enterprise White 500 category (a program operated by Japan’s Ministry of Economy, Trade and Industry). LIXIL’s health maintenance and promotion measures, which include activities to prevent increasingly severe lifestyle diseases, mental health education, and exercise promotion, received high praise, and we received a top-class evaluation overall thanks primarily to our superior systems and implementation of measures and policies.